Now that winter is here have you found that you have a room in your home that just is not warm enough? With the electric heaters from Comfort Furnace, this no longer is an issue. Comfort Furnace is an attractive electric furnace that is both safe and efficient. 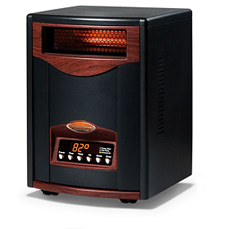 It costs less than a coffee maker to run this electric space heater (less than $1 a day)! And, by using infrared heat, like the sun, it is more effective than the traditional electric heater. Unlike most heaters that provide uneven hot spots, the heat from a Comfort Furnace surrounds you–no matter where you are in the room. It heats the air through infrared heating elements. The result is an even, soft heat that is normally balanced between the floor and ceiling by no more than a few degrees difference. Because of today’s spiraling gas, oil, propane, and other energy costs, The Comfort Furnace will pay for itself in no time, and it is designed to last 15-20 years. But this electric heater also promotes healthier, cleaner air. Comfort Furnace heaters destroy bacteria, virus, mold, mildew and other organic organisms that cause respiratory distress, colds and flu’s. They are the perfect heating source for your home. And, it is a safe source of localized heat that cannot burn or harm your pets, children, or furniture. But even better, the comfort furnace is attractive. Invite people over to and see if they can spot your new Comfort Furnace which looks more like an end table. Unlike the dangerous and inefficient space heaters of the past, it looks exactly like a piece of furniture. Which means this more efficient and effective way to heat your home can match your décor as well. So if you have a refinished basement that just is not warm enough, or a tucked away home office where the heat does not travel too, no worries, West Sport in Sudbury has the answer. Located near Framingham, Marlborough, and Wayland, visit or call us today.